What a wonderful year we have had, next year is our 17th year! and our school goes from strength to stength each year. We have taught a lot of puppies and dogs and we have honestly enjoyed helping each and every one of our pupils enjoy and understand their dogs. A big thank you for all the kind comments you have given to others and ourselves. We held our Diamond Jubilee Party which included a fancy dress competition which was won by Gill and Evie and lots of games for the handlers and dogs to enjoy. We also had an indoor picnic which was enjoyed by all, and a dog tombola ( dog retrieves tennis ball with number on it! ), we also did our dancing with dogs routine. SUE and MILLIE winning 1st prize in Beginners. BEV and MAX 5th prize in Pre Beginners. ANNE and BARCLAY 2nd prize in Beginners. Congratulations. At the Border Collie Club of Wales obedience dog show, Shotton. Nightingale Hospice summer fair held at Bellevue Park Wrexham. Our display team of 18 dogs and handlers performed their obedience and dancing with dogs display to entertain the crowds. All went well and we were very pleased to be able to help the charity raise money. Well done everyone. Congratulations to SUE and MILLIE 5th in Novice at Preston and Fylde obedience dog show. Congratulations to BEV and MAX winning 5th place in Pre Beginners at Chadkirk obedience dog show. The fete opens at 2pm and we will be performing at 2.30pm. CANCELLED AT THE LAST MINUTE DUE TO THE AWFUL WEATHER! We had a training and practise session instead ready for next week and enjoyed homemade cakes from Bev and Max. NIGHTINGALE HOSPICE DOG SHOW AT BELLIS FARM SHOP, HOLT. Once again we all enjoyed doing our display for this worthy charity, we had a team of 15 dogs and handlers strutting their stuff and all went well. We would like to say thank you to Laura Parry from the Nightingale Hospice for inviting us. CONGRATULATIONS. At Blackpool dog show. OLYMPADOGS CHARITY FUN DAY AT OUR SCHOOL IN RHYDYMWYN. We will have some fun games with an Olympic theme for our pupils to take part in. This will also be a charity event and our school will take part in a SPONSORED 10 MINUTE DOWN STAY, we hope to raise a good amount of money which we will donate to NORTH WEST CANCER RESEARCH. Wow what a day we have had, great competitions, great winners, great cheers, even a Mexican wave! The fete that was cancelled in July will go ahead at 2pm today and our display will take place at 2.30pm. We are looking forward to strutting our stuff again to entertain the crowds. Our last display of 2012 went extremely well with massive applause from the big crowd watching us. Thank you to all in the audience who contributed to NORTH WEST CANCER RESEARCH FUND today. CONGRATULATIONS. At Newton Heath dog show. CONGRATULATIONS. At Darlington dog show. Well done Janet having a really good year with Bruno. Progress test; This test is for our Advanced and competition class, they will compete against each other for rosettes and trophies. We had a super day- 18 dogs entered the pre beginner competition which is for the advanced class and 9 dogs were entered in the beginner class which is for the competition class. We had a lovely day at Shotton and Colin and I are very proud of our pupils achievements especially Sandra and Maisie as this was their first dog show; we all look forward to the cakes on Saturday! 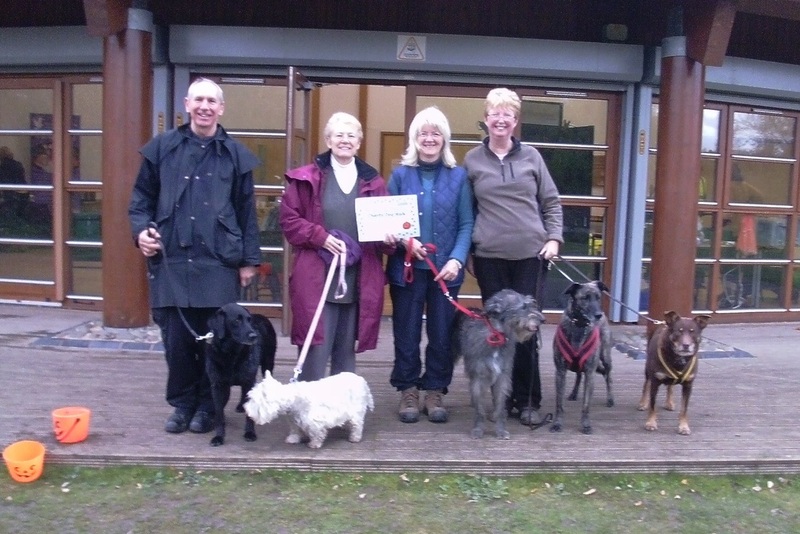 The intrepid 5 walked the 5 km route at Alyn Waters park to raise funds for the Nightingale Hospice. We all enjoyed the walk and met lots of lovely dogs and owners on the way round, well done to everyone who made the effort to do the walk and thank you to the organizers for the dogs goody bags and certificates awarded to us at the end. Well done Janet on a great year, can`t wait for next season! Dogs Christmas party will be held at Rhydymwyn today. We will have some fun and games with lots of prizes and presents for the dogs. Don`t forget the fancy dress competition! Photos to come. Our annual Christmas dinner will be held at THE BEAUFORT PARK HOTEL. Dog of the year awards will be given to our competition class pupils who have won prizes during the year. I promise to put next years newsletter the other way up!